This past week, Governor Jerry Brown of California signed a bill into law that makes it legal for a dying person to end his or her life. 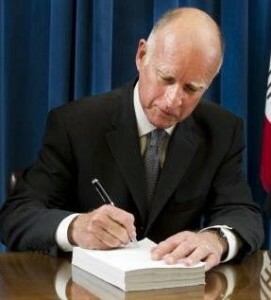 When Brown signed the bill, he also released a letter to the state assembly explaining why he agreed to sign it. The law requires that patients are able to administer the life-ending drug themselves. Also, their decision must be submitted in written form, signed by two witnesses and approved by two doctors. California becomes the fifth state to have a right-to-die law. New Mexico, Oregon, Vermont and Washington are the others. For more information about end-of-life decisions, go to www.diesmart.com. Don’t Pay an Inheritance Tax on Your Own Money! This entry was posted in Other Medical Directives and tagged death, diesmart, Estate Planning, euthanasia, Probate, right-to-die, www.diesmart.com on October 11, 2015 by Minna Vallentine.